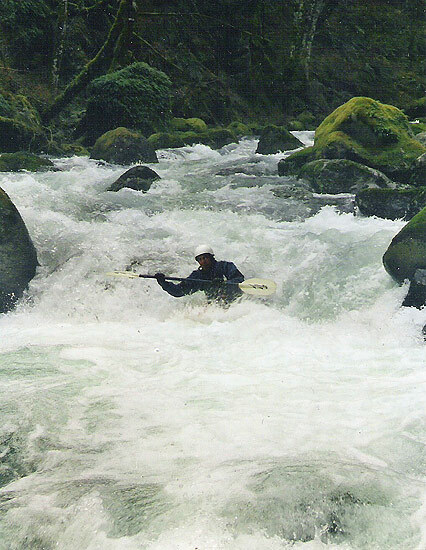 Copyright © 2005, Ron Reynier and Oregon Kayaking. 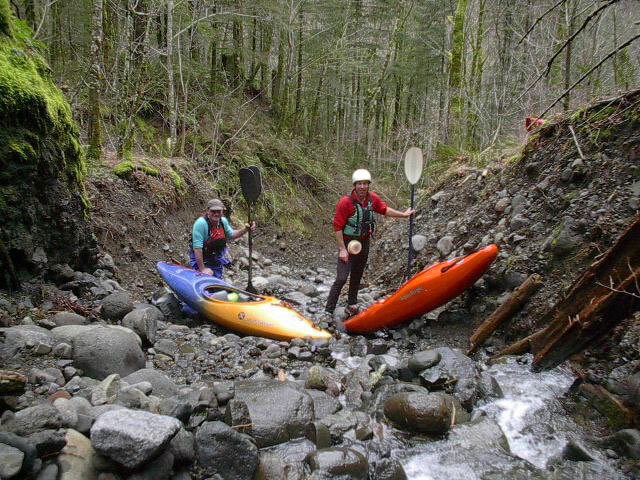 No part of this page may be reproduced, linked, or copied without the express written permission of Ron Reynier and Oregon Kayaking webmaster. I had plane scouted before. My memory of hanging upside down in the bubble cockpit of an experimental plane took me back to scouting the Ohanepecosh many years ago. Half nauseous, we had surmised the Ohanee looked class 3+ from the air. Of course it wasn’t, and we smashed Dancers for two long days exploring that canyon. Much older and marginally wiser, I looked over at my new pilot with curiosity. He gassed his plane from a tank in the bed of his pick-up then tried to clear ice from the plane’s windshield with his Camelback. The prop blew the water everywhere, and we took off with him squinting through a quarter-sized hole in the ice. The plane’s airspeed cleared the windshield just in time for a great view of Spirit Falls on the Little White Salmon, and we screamed downwind with an easterly winter blast. A big wide arc above the headwaters of Rock Creek brought us over a snow covered ridge and small lake, flying due south. Five miles and 3,000 vertical feet below us was the Columbia River, connected to the lake by Hamilton Creek. Hamilton Creek looks pitiful where it runs under SR 14 near North Bonneville, Washington and so it has remained untouched. 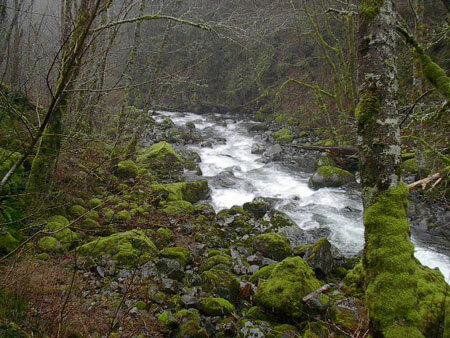 There is no road up the canyon nor obvious trail, and the creek is generally just a trickle. But on this February day there was whitewater in the canyon and from the air it looked class 3+, so I was fairly sure that it wasn’t. Hemmed in by the central Gorge, my pilot Corey would gain altitude by circling ever higher in front of the cliffs just east of Beacon Rock. He would then fly up Hamilton Creek canyon, do a quick turn over the ridge and point the nose steeply back down-river. He commented that the wind blowing over the ridge to our east created a huge hydraulic which pushed us down so he would just fly the plane and not rubberneck to avoid a huge auger into the canyon. Low passes with the motor wind on my Nikon gave us aerial shots of the whole river. We taped photos end to end and Hamilton Creek appeared like a great white snake stretching across my kitchen table. Part of the great white snake. 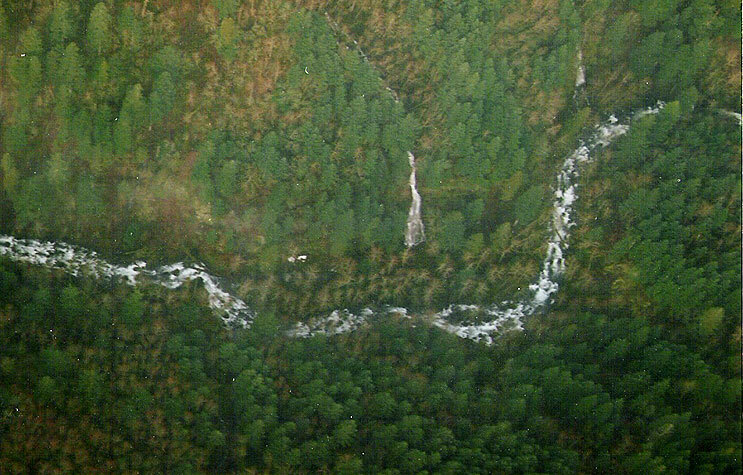 Two side waterfalls mark the drop Pick-Up-Sticks. Seeing this in 2004 was ironic, given that Hamilton Creek is so close to Portland. But the irony only got better. Hamilton Creek’s anonymity came from its topography with no road or trail within easy reach. Within a week of our flight and by sheer coincidence, a local hitchhiker told Corey that a train used to haul logs down the canyon, a potential solution for us to get up the creek. Finally, to our utter amusement, the take-out appeared to be the parking lot of the local Chevron mini-mart. A week later we explored the canyon on foot at low water. 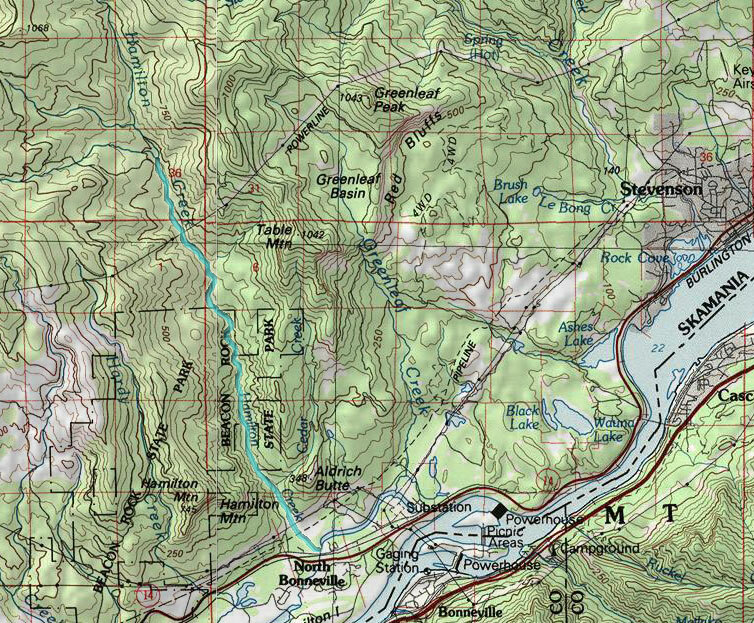 Within a quarter mile of SR 14 the streambed compressed, the gradient increased and Hamilton Creek transformed. At first similar to Rock Creek, it turned a corner and just climbed away. Unfortunately, we noticed no trail and the hike up the riverbed without boats was a killer. We guessed it would be a multi-day ordeal to get upriver with gear, not to mention the problems of hiking up the creek when it was full of water. Late in the day and miles up the canyon we stumbled across a railroad rail near the creek that had obviously fallen from above us on the canyon wall. After sprinting back down the creek, we resurveyed the area in the twilight and followed a hillside depression above us. An abandoned rail bed headed upriver and, just like that, the puzzle of getting boats up the creek was solved. It rained hard in March and the E. Fork Lewis hovered at 1600 c.f.s.. with snow just above the Hamilton Creek drainage. Corey Williams, Roger Stewart and I left the car very early. We soon ferried across the creek, then negotiated the multiple washouts on the rail bed for three and half hours. 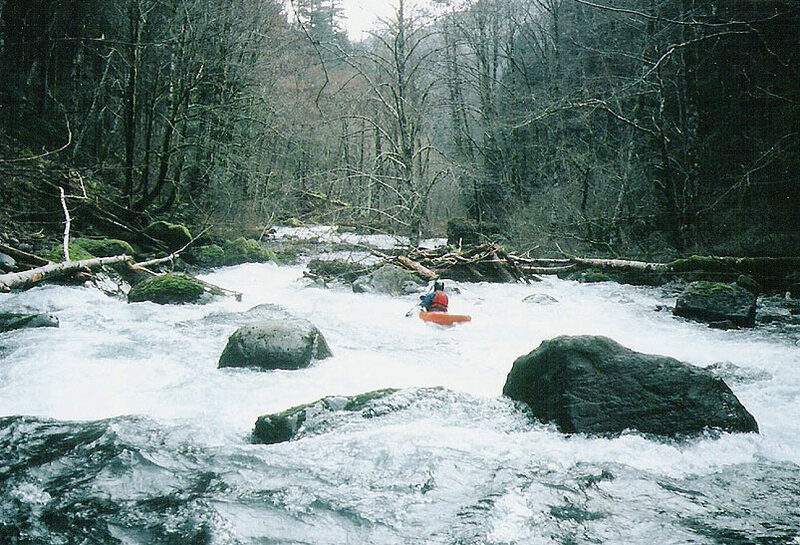 Typical Hamilton Creek rapids, taken during our low water scouting trip. 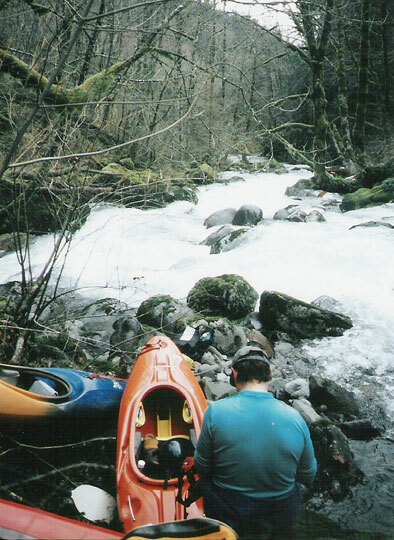 Hiking upstream in the Spring of 2004, just after the ferry across the creek. Roger and Ron groveling through a small washout. The occasional view from above, taken on our Spring 2004 hike in with boats. We finally lowered 250’ to the creek and were psyched at water-level because the creek was just rockin! Two different views of the put-in, on the left the put-in during our low-water scouting hike, and on the right the put-in on the day we ran the creek. The author in a drop near the put-in. Boulder gardens stacked up in succession and were spiced up with an old growth limbo log and at least one walk at Pick-Up-Sticks (class 5 without the wood). There were no big waterfalls, only steep, windy drops in a beautiful canyon. There are three side waterfalls cascading in from the west side of the river. 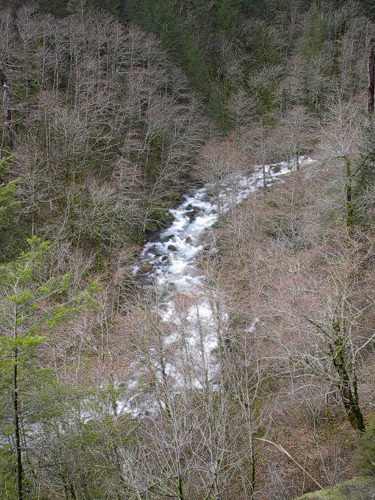 The two upstream falls are close together, easily seen from the hike and signify Pick-up-Sticks just around the corner. All in all, this run seems to be another great adventure in the Gorge. Stats: The run is about 3 or 4 miles and class 4/5. This hike has you whooped by the time you get to the put-in. Upper Trout Creek is probably a good comparison overall although some of the mid run boulder drops are big and not boat scoutable. One is just marginally walkable. All of the upper drops run together and some sharp corners have limited eddies, including the one above Pick-Up-Sticks. Park a car at the N. Bonneville Chevron. Go out of N. Bonneville and take a left on SR14. Take the next immediate right on Evergreen Dr. Take the next left where a gravel road leads north past a metal shop under the power lines. Park where the road is now closed by a berm. It should have taken about 4 minutes from where you left the other car. The Hike: Follow the rough road over the berm into the woods. It runs flat then eventually goes uphill before coming back down to the river in the first quarter mile or so. Gear up and ferry across the river. Gear down and continue carrying up the east side of the river on a less obvious, sometimes narrow trail. When the trail vaguely forks, follow the hillside depression sharply uphill to the right. You’ll come to a big landslide. You should be about half-way up the slide when the trail disappears over the edge. Carry up to the right of the landslide through the forest. Go around over the top to the other side of the slide. You will pick up the trail again on the other side of the slide. From there, the old rail bed is more obvious. There are three or more huge washouts which you grovel or line through. After an awesome overlook with thick moss on an old gnarled tree, getting down to the river will soon look more feasible, but it is still steep. 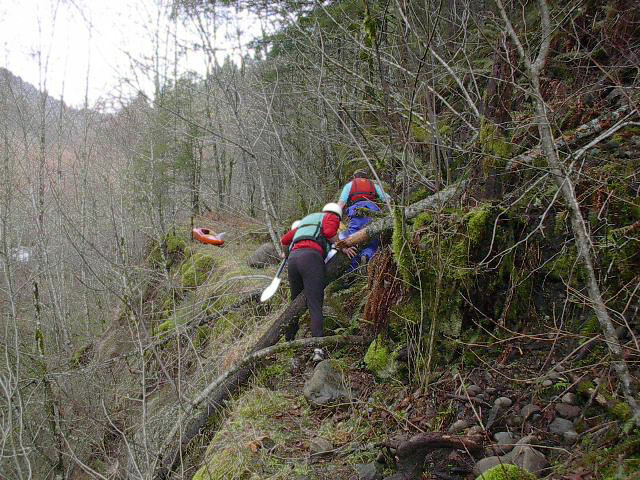 We took a prominent gully system below a small rock headwall and lowered off trees. Four or so rope lengths down will put you at the creek. It should have taken three or four hours from the car. Hazards: The most complex drop, Pick-Up-Sticks, has too much wood right now. Other drops push together around corners and one had a chunk of old growth mid-drop which required a short walk. There is one big limbo which may be too thin for big boys at higher flows. Takeout: Boat under SR 14 and immediately look on your left for a place to hop out between the briars. Go up a few feet, over the bike path and walk across the lawn to the Chevron. The attendant asked me if we had just kayaked the Columbia slough. Gauge: Instead of turning back to the powerlines, go straight to the bridge on Evergreen Dr. which crosses the creek. Don’t laugh. It’s pitiful here. Look over the bridge on the downstream side where a small metal culvert comes into the creek from the west. The creek needs to be spilling into the culvert by 3 inches at least. A little water in the culvert goes a long way upstream and half a culvert will be movin' up above. Also look for at least 1600 cfs or more in the E. Fork Lewis gauge with wet snow at higher elevations. Flows: For reference, It rained hard in March and the E. Fork Lewis hovered at 1600 c.f.s.. with snow just above the Hamilton Creek drainage. The Clack was at about 2600 and the Hood was at 5' or so which leads me to believe this runs reasonably often when it rains on higher elevation snow. However, I think that was the last day it ran all spring. Once the snow is gone though it takes a lot of rain. Postscript: With no snow this year, complex road access from above may have happened. But generally, by the time the snow is gone, so is the water. Editors Note: Special thanks to Ron and his crew for being the first to document this great run for future generations. Hamilton is destined to become another classic, 'must-run' gorge creek. Hamilton Creek has been the subject of intense interest in recent years, with at least four different teams focusing a fair amount of time and attention on this run. 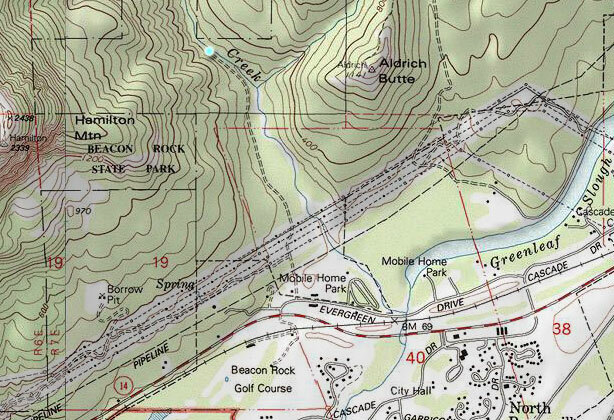 I remember John Whaley ( one of the most prolific and dedicated exploratory creekers around ) telling me about hiking the lower part of Hamilton back as early as 2001, but neither of us ever got around to exploring it more thoroughly until later. In early fall 2003 Jesse Coombs, Pete Giordano and myself hiked Hamilton from the roadbridge up to where the creek forks, about four miles. We found a terrific creek, very steep and high quality. Even with no water we were very impressed with the scale of the rapids. Besides Ron's team, I know of at least two other groups who have more recently run this creek. I know for sure that John Whaley and Jon Loehrke ran Hamilton sometime in late 2004, taking advantage of the lack of snow on the roads to drive to the put-in. The John's ran the creek in it's entirety, from above the forks to the road bridge. 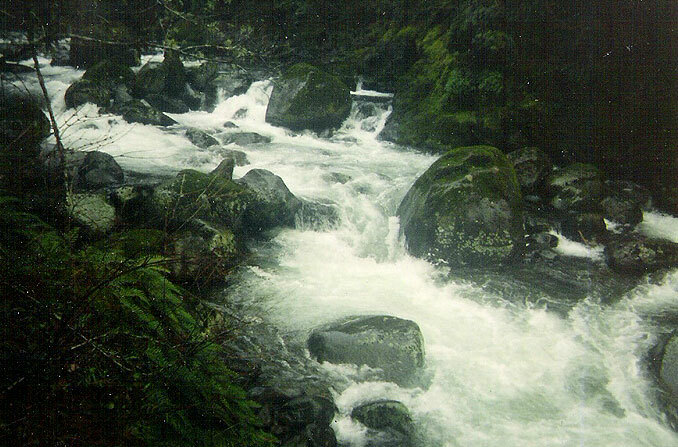 If anyone knows about other descents of this creek, please let me know. Note: The other groups all drove to the put-in for Hamilton. I haven't actually made this drive, but I have heard that if you turn at the Beacon Rock ranger station you can drive up very close to where the creek forks, about four miles up. This road gets snowed in early and stays snowed in until the water is gone, so timing is critical. This shows the access road if you want to hike up Hamilton. The blue dot shows where the road ends and the hike begins. The road that goes up the creek is not clearly marked. Nevertheless, if you poke around enough you'll find it..